"The aim of the Royal London Yacht Club Charitable Trust is to provide bursaries for young people whose parents cannot afford to send their children on character building maritime activities". To advance the education and training of young person's up to the age of 25 years, from the Isle of Wight, in sailing, boat handling, seamanship and navigation. To provide facilities for such training through other charities such as the Tall Ships Youth Trust, the Jubilee Sailing Trust for disabled people, and organizations such as Sea Cadets and the Isle of Wight Youth Activities Centre. In order to help the beneficiaries through their leisure time activities so to develop their physical, mental and spiritual capacities that they may grow to full maturity as individuals and members of society and that their conditions of life may be improved.To assist young persons in competitive sailing events." The RLYC Charitable Youth Trust was formed in 2009 and introduces youngsters from the Isle of Wight to sailing and other waterborne activities. It also seeks to support young Olympic hopefuls from the Island, allowing them to develop and compete on the International scene. 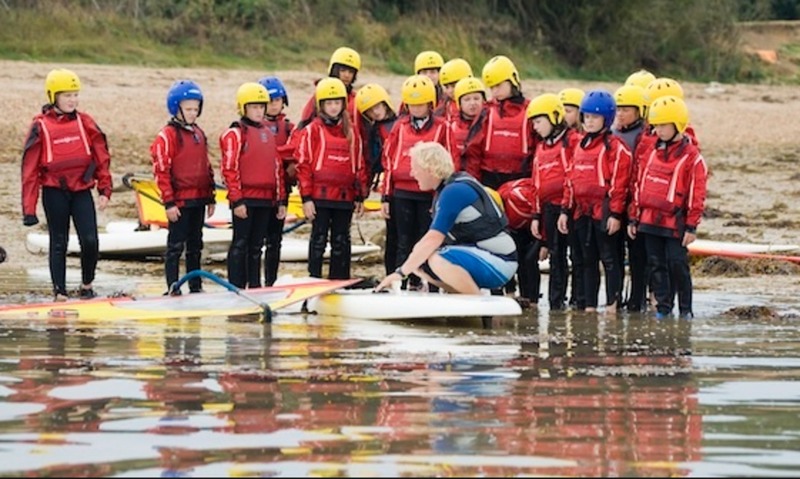 The Trust has worked closely with UKSA to identify children, especially those from a disadvantaged background, and this works well with the UKSA's aim to get all Island schoolchildren in year six on the water in any one school year. The Trust is funded by donations from Members. We continue to give support to the ASTO Regatta which usually takes place on the first weekend in October. This annual event is a popular end to the Sail Training season, with up to 30 boats taking part each year. Each of the boats are crewed by young and disabled people, many of whom have never sailed before. While the race is highly competitive, prizes, including a RLYC trophy, are also awarded for the best dressed crew and the Spirit of the Race. The Cowes Sea Cadets were the chosen Charity for Classics Week in 2017 and the Trust has also always offered support to the cadets to gain sea time experience on the TS Royalist and TS John Jerwood. The Cowes division have on loan the Flying Fifteen, 'fflyme' donated by a Member but owned by Youth Trust. The Club through the Trust continues to support for the Royal London Etchells Youth Academy that was launched in March 2016 and provides selected youth sailors the opportunity to race in three fully funded Etchells Class yachts in the many regattas that take place in Cowes during the season. The selected crews of the three boats are made Academy Members of the RLYC. In 2018, we were able to support a team, consisting of William Bedford, Fraser Woodley, William Birch-Tomlinson and Ella Bennett from our Etchells Youth Academy at the Etchells North American Championships in Chicago. Sailing against some of the top Etchells sailors, including the current and several past World Champions, made for an extremely tough event. The team finished in 12th overall and 2nd in the Corinthian class. They were winners of the "Olin Stephens International Youth trophy "The team said that afterwards that they "learnt a lot from their experience and thanked everyone who supported them, with a special mention to the North American Etchells Fleet, David Franks and the RLYC Charitable Youth Trust". Chris Rashley has been supported by the Trust for many years, initially a very talented young catamaran sailor he came out of the Tornado when it was dropped from the Olympics and was put into a 49er squad by the RYA. Chris then moved into the Moth class which is probably one of the most difficult dinghies in the world to race. Chris won the Europeans five times and was runner up in the Worlds twice. He has been racing against and beating at times Americas Cup helms Nathan Outteridge (Artemis) and Peter Burling (Emirates Team New Zealand) and top UK sailors Paul Goodison Gold medalist and twice Moth World Champion and Ron Greenhalgh a winner of the Volvo Ocean Race and the Extreme Series. The Royal London has done well with their support getting Chris, from St Helens on the Island, up to this level and Chris has been a good ambassador for the club always racing under the Club burgee and displaying the logo on his boat. Chris is no longer a youth but is still being supported by Members of the Royal London and is being mentored by Alex Thomson and Peter Taylor for his foiling Nacra 17 campaign for the 2020 Olympics being part of the RYA squad for this. With his former catamaran experience and being one of the most experienced foiling sailors in the World he is well placed to excel in this class and we wish him the best of luck.